Play Buffet Wars to collect FREE Christmas goodies to exchange for exciting Christmas items! Collect Christmas goodies and recipes to create exclusive Christmas items! You will get at least 1 Christmas goody for each PVE game win. More players in the game, the more you get! All unused goodies and recipes after end of event will be deleted, do collect and complete your recipes before the end of the event! All items crafted or purchased will not expire. Get the Christmas Exclusive Snowman Costume and Christmas Lightings Signage. These will only be on sale during the event. After the event, you will not be able to purchase them any more. What better pet to get for Christmas than a Reindeer, Santa's Favourite! 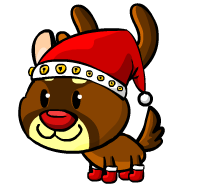 Dress your pet up with a Santa Hat and get into the joyous mood of Christmas. There will be 2 new badges available for Christmas. The badges are not awarded instantly upon meeting the requirements, we will add the badges manually at the end of the event. Obtain the Christmas Tree and Snowman Costume. Get ready to collect your Christmas Goodies! LOL, not until 31/12/2011? Why i play today i dun get any ingredient for that? ADMINISTRATOR ur game is lagging now what's ur gonna do !!!?? ?